One Moveable Feast explores cultures through cuisine. It’s about connecting people with their stories and histories, and honoring traditions and recipes—some of which have been nearly lost in our modern world. Our mission is to share diverse, engaging narratives with a literary bent from kitchens and tables around the globe. I invite you to join the feast! To submit an idea for the series, please drop us a line . A freelance writer and editor whose feature articles have appeared in The Daily Beast, Wall Street Journal India, Forbes India, Condé Nast Traveller India, and Culture, Kristin has also written for ISLANDS, Wine Enthusiast, and Food & Wine, among others. She has worked as a freelance Reporter at Condé Nast Traveler and a freelance Researcher at InStyle and Vogue. Travel writing assignments have taken her to various domestic and international destinations including France, India, Croatia, Argentina, and the Maldives, plus other incredible corners of the world. In addition, she has visited dozens of countries for personal travel. 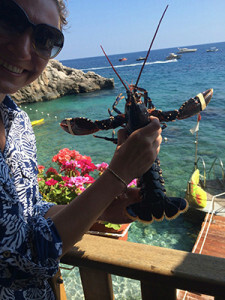 Kristin is a Contributing Writer at Organic Spa Magazine and a freelance Travel Expert/Correspondent for Jetsetter.com, where she helps clients customize itineraries to Croatia and writes copy for the site. She lives in New York City with her Indian husband and Japanese Chin, Sachi. • If you’d like to use our photos, content or recipes, please ask or link back to our site.